He was the U.S. ambassador to the United Nations. He served in the U.S. House of Representatives. He became only the second African-American mayor in Atlanta’s history. Perhaps most impressive, Andrew Young operated as one of the top lieutenants for Martin Luther King Jr. When the drum major for justice was assassinated at 7:01 p.m. Eastern time on April 4, 1968, on a balcony of the Lorraine Motel in Memphis, Tennessee, Young rushed from the parking lot below to his side. Every moment of that day stays fresh on Young’s mind, and he gave his first-person account of what he saw and felt before, during and after King’s death to The Undefeated. So after being in court that whole time, and really on the witness stand for about an hour, I returned to the Lorraine Motel just about 4 o’clock. Dr. King, his brother [Alfred Daniel Williams King, known as ‘AD’], Ralph Abernathy, well, they were all in his brother’s room downstairs, which was the bigger room. They had been eating catfish, because Memphis was famous for its catfish dinners and somebody had brought in a whole tray. So they were all eating and drinking that sweet tea, and they were laughing and having a great time, sort of like his old gang, the guys he grew up with. That’s when somebody picked up a pillow and threw it at me, and I threw it back. The next thing you know, you’ve got Martin and Ralph and everybody grabbing pillows. It was one of these big rooms with two double beds and sort of suite, and then everybody started to pick on me. I made a feeble effort to fight back, but finally, Dr. Billy Kyles knocked on the door and said, ‘You all need to be getting ready. You’re supposed to be at my house for dinner at 6 p.m.’ The pillow fight stopped, and Martin said, ‘Well, I better get ready. I need to go upstairs and put my shirt and tie on.’ He left. By the time Martin got his shirt and tie on, Ralph wasn’t dressed yet. But Martin came out on the balcony, and I was down in the parking lot with [civil rights activist] James Orange, who was about 6-foot-5 and 275 pounds, and I was even smaller than I am now. Despite our size difference, James and I liked to shadowbox. So we were shadowboxing in the parking lot, just clowning around, and at first I thought it was a firecracker. That’s when I looked up, and I didn’t see him. So I ran up the stairs, and he was lying on the ground in a pool of blood. The rifle shot came from somewhere across the street, and the police were over there but they came running toward us. That’s when we all began pointing and shouting, ‘No, go back over there! The shot came from over there!’ But the police kept leaving the area from where the shot came from to run to where we were. We called [Coretta Scott King, Dr. King’s wife] and told her what happened, and the ambulance came to take him to the hospital. Even though I went to the hospital, I knew there was no hope. 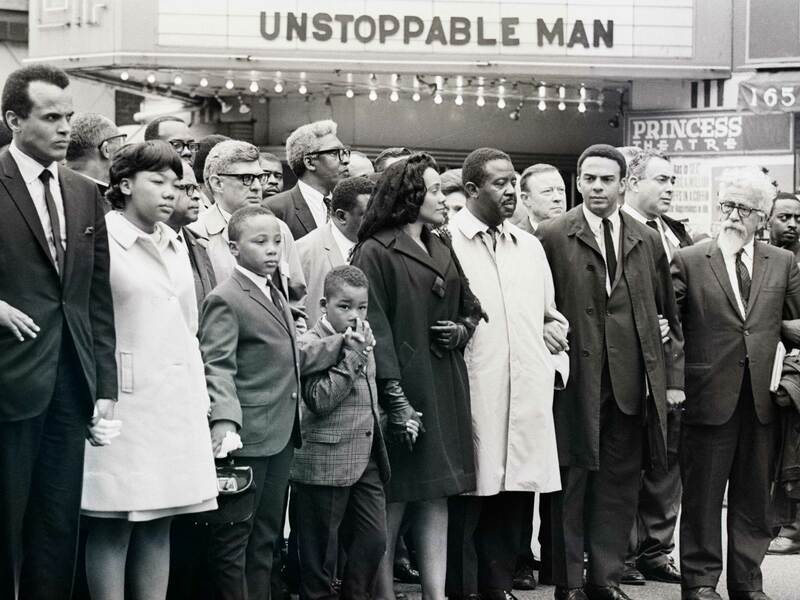 On April 8, 1968, Coretta Scott King led 10,000 people in a march through Memphis in memory of her husband Martin Luther King, Jr., who had been killed just four days prior. In front row are (left to right) singer Harry Belafonte; King’s daughter, Yolande; sons Martin III and Exter; Mrs. King; Rev. Ralph Abernathy; and Rev. Andrew Young. The thing that disturbed us the most was that people started rioting, and we kept trying to talk to the press about getting folks to realize that this isn’t what Dr. King would have wanted. But the reporters wanted to talk to the rioters more than they wanted to hear from us, and that was kind of tragic. We left the hospital, and we got back to the motel about 10 o’clock that night, and we basically said, ‘Look. We have to keep Martin’s movement going.’ I don’t know how, but we already had planned to go to Washington with 24 different groups of poor people [for the Poor People’s March on Washington that spring]. For the first time, the movement wasn’t mostly black people, but we had invited several Appalachian groups, white groups from the big cities and rural areas, senior citizens, three or four Hispanic groups from the West Coast and Native American groups. It was following Martin’s desire to raise the question of poverty. From the very beginning, the civil rights movement was about leading America away from the triple evils of race, war and poverty. Here we are, 50 years later, and we haven’t solved those three problems, but Martin gave us the dream. Also, when I look back 50 years, I know he died instantly, and it became clear to me on the balcony of the Lorraine Motel that only his body had been killed, but his spirit lived. In so many ways, it still lives today. After working as an award-winning newspaper sports columnist for three decades, Terence Moore is now a national TV sports commentator and Internet sports columnist based in Atlanta. He also is a visiting professor of journalism at Miami (Ohio) University, his alma mater.